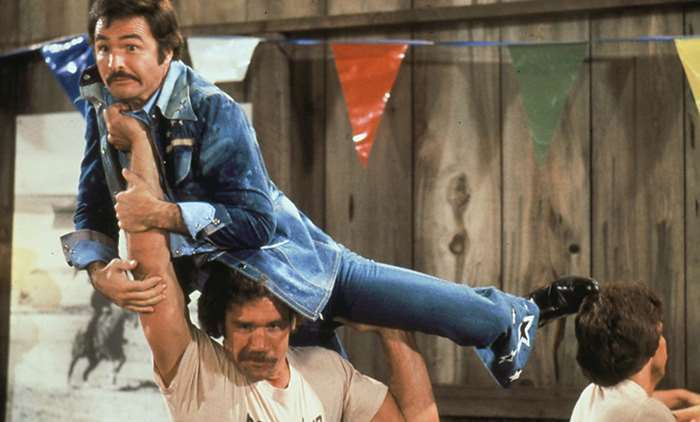 Sonny Hooper (Burt Reynolds) is the top stuntman in the business. But age and years of injuries on his body are catching up to him. He’s keeping himself together with painkillers and the knowledge he’s a the first to get the call for the most dangerous stunts needed. His girlfriend Gwen (Sally Field) wants him to stop his stuntman career. His pal Cully (James Best) wants him to stop. And mentor, former stuntman and Gwen’s father Jocko (Brian Keith) knows Sonny’s time in the limelight is nearing its end. This is reinforced with the arrival of younger, more audacious stuntman Ski (Jan-Michael Vincent) on the scene. But Hooper wants to manage one last epic stunt before he hangs up his pads. The question is can he survive it. Hooper is a time capsule. A slice of cinema history when Burt Reynolds reigned supreme as the biggest movie star in the world. It was a period when his charisma, mustache and laugh was enough to draw in audiences to fill theaters for his newest movie. That only lasted for so long. After awhile moviegoers started to want more for their ticket price and Reynolds continued to just ‘Rat Pack’ his way through movies until barely anyone was showing up to watch. I guess he began to lazily rely on ‘good ole boy’ action/comedies, a genre which would become his and director Hal Needham’s signature. But it’s shelf life had expired by the mid-80s. While he would do other films, notably action roles throughout the decade, they would go bust one after another. Reynolds was no longer a draw, his star dimmed and his film career never recovered. He would only find salvation with his television show Evening Shade and helping to create the game show Win, Lose and Draw. But all that came later. Now it’s 1978 and Reynolds and Needham reteam a year after their huge hit Smokey and the Bandit. By the way, it’s funny how stuntmen became such a popular trend around this time. There were a bunch of movies that centered around the exploits of the anonymous stuntman. Maybe it had something to do with popularity of Evel Kenieval. The stuntman fad continued right into primetime television with Lee Majors as The Fall Guy. I sometimes think if they were going to remake that show today it would have to be called ‘The CGI Guy’. Watch the adventures of the computer technician that make movie thrills happen! A stuntman? What’s a stuntman? 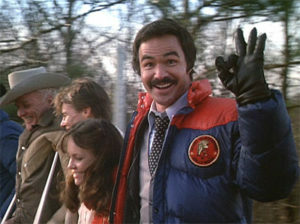 I like movies about making movies and Hooper includes a lot of inside jokes and nods to moviemaking, biographical and personal connections to the story by the filmmakers and the cast, along with of course that ‘good ole boy’ action/comedy tone that would become the format for Needham and Reynolds’ teamings. Some parts I like more than others, but Hooper never all comes together to make a good movie for me. At best I would say Hooper is OK. It’s a diverting entertainment, but it’s not something I would recommend, unless to someone who’s a Reynolds fan of course. The older horse nearing retirement soon to be replaced by the younger stud is a widely used story trope and that works here. It’s the same situation that occurred years earlier when Hooper came along and replaced Jocko, only now Hooper finds himself in the elder role. It’s a nice idea with Reynolds seeing his mortality laying ahead and it provides some quiet reflective scenes as he comes to the realization that his run is eventually going to end. Now he has to decide whether he’ll try to risk life-threating injuries to prolong his status or accept moving out to the pasture. I really like that Ski is not made out to be a clichéd ultra-mean, arrogant adversary of Hooper’s, but is in fact a likable guy. He’s just the next link in the chain of stuntman and he has no animosity towards Hooper or is anxious to push him out of the spotlight. So, there are no silly scenes of him insulting or intentionally trying to embarrass Hooper, stuff I would have expected to see. Then we have the ‘making of the movie’ scenes where Hooper is on-set doing his ‘gags’ for pompous director Roger Deal (Robert Klein). They’re making a movie called ‘The Spy Who Laughed at Danger’ a clear take on The Spy Who Loved Me, with Adam West as the star. Yes, THE Adam West! Reynolds is Adam West’s stuntman! That is so cool. It’s hysterical watching how the movie portrays Reynolds stepping in for the dangerous stuff so matter-of-factly. With great concern and safety they call “Action!” as West grabs a high wire and in three seconds they yell “Cut!’ and Reynolds steps in to do the stunt and take the fall. There’s some fun old school real stunts to watch and there’s always the amusing back and forth wisecracks thrown about. I would have loved to have seen that fictional movie they were making. From what I can tell, I really don’t think it would have made a lick of sense! Klein gets the idea of ending his movie with a stunt-filled ending, with a rocket-powered car jump as the finale. It’s up to Reynolds to decide to agree to it while all indicators and everyone is telling him not to do it. The big stunt sequence at the end may not be as impressive as it was in 1978, but it’s still an awful lot of fun. Some of the car crashes and explosions have lost their luster over time, but the collapsing smokestacks with the racing car narrowly avoiding them makes up of it. I actually think that part looked cooler than the long car jump. The third component of the movie is that ‘good ole’ boy’ comedy and that’s where the movie loses me. Bar fights, country music, being joking at dopey policeman. A little of that stuff goes a long way for me – a very long way. I guess at the time that kind of humor seemed fresher, but today watching Reynolds trade barbs with Terry Bradshaw, punching him and Bradshaw just smiling is not as knee-slapping to me. Somehow that kind of stuff dilutes the main story. 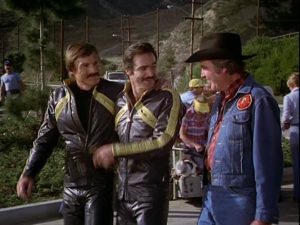 I would have liked more time spent on the aging stuntman and that story than the usual Reynolds/Needham scenes with Burt being Burt. The movie doesn’t delve as deeply into the most interesting aspect of the story which is focusing on Hooper and this crossroads he’s approaching. I would have liked that more. The main story simply becomes serviceable. This could have been the ultimate stuntman movie – there’s a great cast in it! It was afterall made with the intention of being a love letter to the overworked and under-appreciated stuntman. 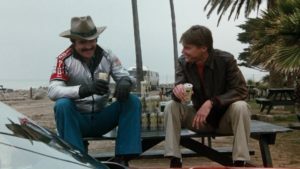 I know it’s a Hal Needham film and there’s a certain type of movie he would make, but I think Hooper could have been more special. Maybe this would have been better had another director been behind it. Instead it just becomes another Needham/Reynolds collaboration. It’s on the higher end in that category, but not as good as it could have been.